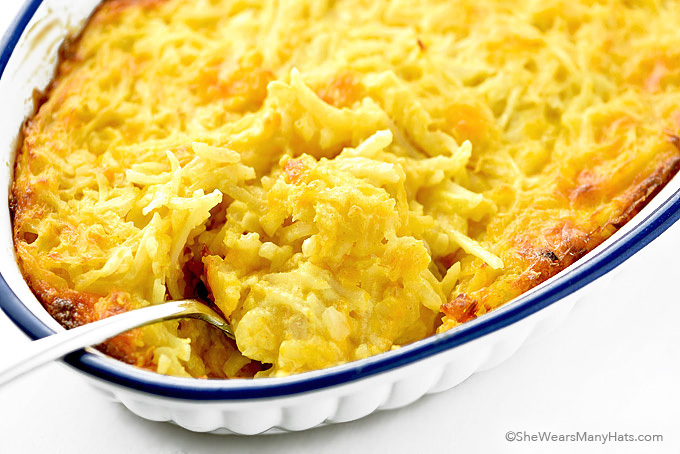 This all-time favorite Cheesy Hashbrown Casserole Recipe is not just for breakfast. 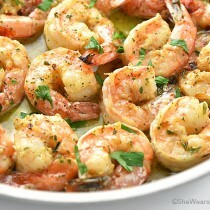 It’s an equally delicious side dish for any meal of the day. 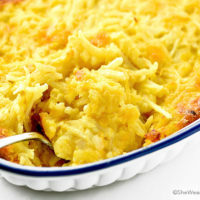 We enjoy this classic favorite Cheesy Hashbrown Casserole Recipe all throughout the year. Made with shredded potatoes and cheddar cheese, this cheesy casserole is an excellent addition to breakfast, brunch and even makes a great savory side dish that perfectly compliments ham or beef. Plus, it can be easily prepared ahead of time and rewarmed or cooked before serving, which makes it a fabulous choice for entertaining. 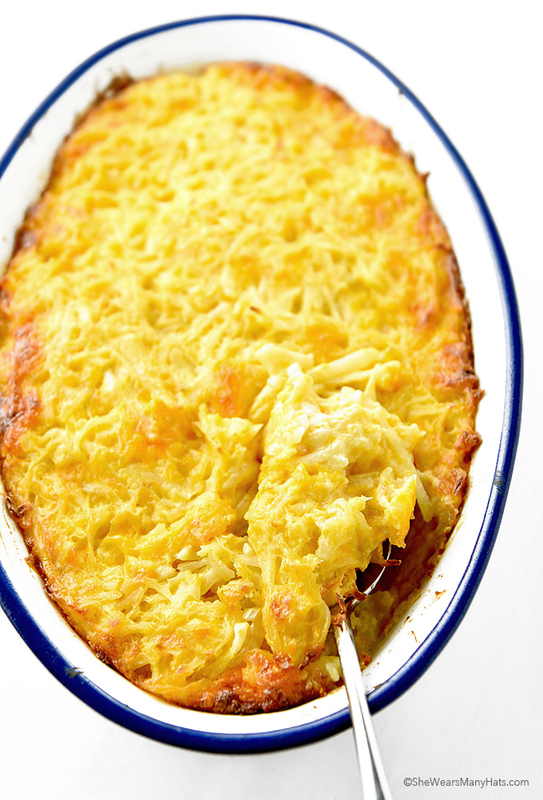 Cheesy Hashbrown Casserole couldn’t be easier to make. Super duper easy! While the oven is preheating, butter or coat a baking dish with cooking spray. Next, mix together shredded potatoes, cream of chicken or mushroom soup (or a homemade substitute, found in recipe notes below), shredded cheddar cheese, sour cream, chopped onion and ground red pepper. Spread the mixture into the prepared baking dish and bake at 350-degrees F until hash browns are tender, about 45 minutes or so. 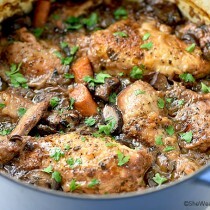 The casserole can be kept in a warm oven until ready to serve. 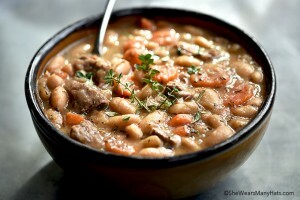 As mentioned before, if you don’t like using canned soup, it is easy to make your own. prepare your own by melting 2 tablespoons of butter over medium-low heat in a saucepan. 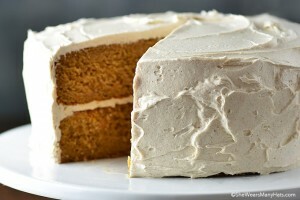 Whisk in 3 tablespoons of all-purpose flour; continue to cook, stirring for 1-2 minutes. Then whisk in 2/3 cup of chicken broth, 1/2 cup milk and 1/4 teaspoon garlic powder, continuing to whisk until it slightly thickens. Continue to simmer for 1-2 minutes, stirring occasionally. This easy homemade substitution is perfect for other casseroles as well, like Broccoli Casserole or Cauliflower Cheese Casserole. As far as the hashbrowns, you can purchase pre-shredded hashbrown potatoes or make your own using a box grater. Made with shredded potatoes and cheese this easy casserole is a delicious savory side dish for any meal. Butter or coat with cooking spray a 2-quart baking dish. Combine all ingredients and spread evenly into prepared baking dish. This Cheesy Hashbrown Casserole Recipe can be prepared a day ahead then kept covered and refrigerated until ready to bake. 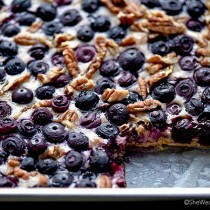 Or go ahead and bake it, then cover, refrigerate and rewarm. *Cream of chicken soup substitution: In a small sauce pan, melt 2 tablespoons butter over medium-low heat. Whisk in 3 tablespoons all-purpose flour; continue to cook, stirring for 1-2 minutes. Whisk in 2/3 cup chicken broth, 1/2 cup milk and 1/4 teaspoon garlic powder, continuing to whisk until it slightly thickens. Simmer for 1-2 minutes stirring occasionally. **Adjust cooking time as necessary to make sure hash browns are cooked until tender. Great comfort food. I think I could make a meal out of this. This was delicious! It was easy to cut in half for just the three of us. I found my sour cream had spoiled but I had half a pkg. of cream cheese which I softened in the microwave and substituted instead. It was even richer and very flavorful. I use cream cheese instead of sour cream in my mashed potatoes so was pretty sure this would work and it did! What a fabulous substitution, Alice. Sounds yummy! 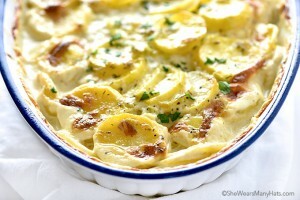 You realize that this is more addicting than Mac& cheese..
Great recipe.Love it with shredded potatoes or hashbrowns. Added 1/2 lb of thick cut bacon. Like bacon makes everything better. Great recipe. Turned out wonderful. If I shred the potato myself do I still have to freeze it for cheesey potatoe recipe. The stores I shopped at doesn’t carry the shredded, or can I use the regular hash brown for the recipe. Made this recipe tonight but subbed plain greek yogurt for the sour cream and OMG…it was SO good! Thanks for posting an easy dinner side that’ll last us two meals.